Located in Lansdowne, Virginia, neighboring Ashburn and Leesburg, Camden Lansdowne offers freshly remodeled one, two and three bedroom apartment homes and outstanding new amenities with a coveted address in the Loudoun County School District. Just minutes from your apartment you’ll enjoy great shopping and unique dining options at One Loudoun – Loudoun County’s New Downtown, Lansdowne Town Center, Leesburg Premium Outlets and Dulles Town Center Mall. The Loudoun Transit picks up right outside our door to connect you to the Silver Metro when you want to explore the DC metro! Each apartment home offers luxury finishes such as custom modern white cabinetry, quartz countertops, glass tile backsplash, hardwood-style flooring, stainless steel appliances including gas ranges and full-size washer and dryer. Our Loudoun County apartment homes also feature distinct details like 9-foot ceilings, architectural arches, crown molding, bay windows and cozy fireplaces. Select apartment homes even feature attached garages or covered parking. 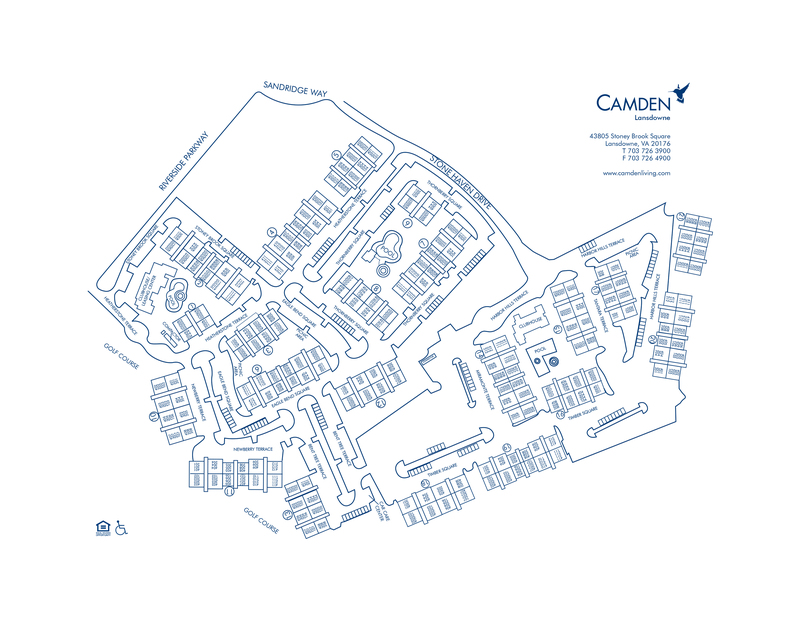 Camden is all about living green so take advantage of at-your-door trash and recycling pick up and enjoy the cost savings of LED lighting and high-efficiency tankless water heaters. Living at Camden Lansdowne also includes incredible resort-style amenities like three saltwater pools with WiFi and sundeck, a brand new 4,000 sq/ft 24-hour state-of-the-art fitness center with CrossFit System, Smith Machine, kettlebells, medicine balls and free weights up to 75lbs. You'll also find elite cardio machines including the Stairmaster Gauntlet, Assault Air Runner, Espresso bike, Rowing Machine, treadmills, and more. But the fitness doesn't stop there. Break a sweat in our brand new 24-hour yoga and cycling studio with WellBeats virtual training system. Time to get down to work? We've got you covered with a brand new private conference room, office and co-working spaces with WiFi printing and USB enabled outlets. Ready to kick back and party? Check out our brand new resident lounge with billiards, entertaining kitchen, and 75" television. We love our pet friends at Camden Lansdowne and they'll love getting pampered in our new 24-hour pet spa with bathing and drying stations. Residents receive a technology package included in the total monthly rent with a savings of up to 46% off retail. This money-saving package includes high-speed internet up to 100 Mbps and over 140 digital video channels through Xfinity. Use the Xfinity Go app on your smartphone or tablet to access your digital video anywhere! We’re pet-friendly and close to the Dulles Greenway, making it easy for your pet to get exercise. We thought of it all so you don’t have to! Schedule an appointment today and experience life at Camden Lansdowne firsthand. Get the perfect spot! We have open parking for our residents with permits on a first-come, first-served basis. Select apartment homes include attached garages and carports. Residents may print visitor permits from their homes for guests.